1. Place the blackberries and sugar in a food processor or blender and blitz until puréed. Press through a sieve into a bowl to remove the seeds. 2. Bring the milk to the boil in a saucepan then pour into a large heatproof jug and stir in the chopped chocolate. Leave for 5 minutes, stirring frequently until the chocolate has melted. 3. Pour into 6 heatproof glasses or mugs then scatter the marshmallows over the top. 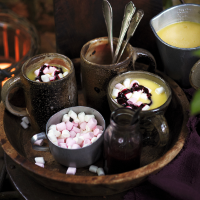 Spoon the blackberry purée over the marshmallows and serve with spoons.